Participants of the brainstorming session on Phytophthora blight of pigeonpea. On 22 July, the pigeonpea core group scientists had a brainstorming session to discuss and share the state-of-the-art research on Phytophthora blight, a disease affecting pigeonpea in an increasingly warmer world. 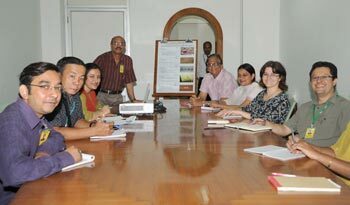 ICRISAT breeders, pathologists and biotechnologist reviewed the work done so far on this disease. Suresh Pande welcomed the group and made a presentation on the objectives of the research initiatives taken up by the Legumes Pathology Unit at Patancheru to tackle Phytophthora blight. He explained the progress made so far in this area and discussed the comparative symptomatology of Phytophthora blight, which is often confused with Fusarium wilt. Scientists found that temporary flooding caused by heavy rains (more than 300mm) for 3-5 days, along with low temperatures (25-280C) is responsible for the resurgence of Phytophthora blight and that the disease attacked pigeonpea irrespective of soil types and cropping patterns. The group discussed the knowledge gaps that have been identified to deal with the disease and the quickest phenotyping protocols to cull out the ultra susceptible material, the mode of action of the disease causing pathogen Phytophthora dreschsleri f sp. cajani and the strategies to manage it. The group also discussed the use of biotechnological approaches to know the genetic diversity in the pathogen, which will help in identifying the race/pathotypes scenario. They also visited the ongoing greenhouse experiments on Phytophthora blight conducted by the Legumes Pathology Unit. Mamta Sharma explained the progress made so far and the reasons for taking this research to the peer group, which will further help in the development of the field screening technique at ICRISAT. Oscar Riera-Lizarazu; KB Saxena; Isabel Vales; Rafat Sultana; Constante Umipig from llocos Sur State Polytechnic College, Philippines; Raju Ghosh; Nag Mangla and Madhavi (Intern) participated in the meeting.